I love a dinner that can be made in one dish. I especially love a dinner that can be made in one dish in the oven, where I don’t have to pay attention to it until it’s done. Both main parts of this meal came from Costco. They had a big 6-pack of chicken thighs, 4 thighs to each pack. We tossed them all into the freezer, and just move one into the fridge every time we use one. It’s also apparently the right time of year for Brussels sprouts, because they’re looking gorgeous right now. I think the 2-pound bag (we used half of that bag here) was less than $5. I made a two-part pan out of non-stick foil (which is the greatest thing since sliced bread). 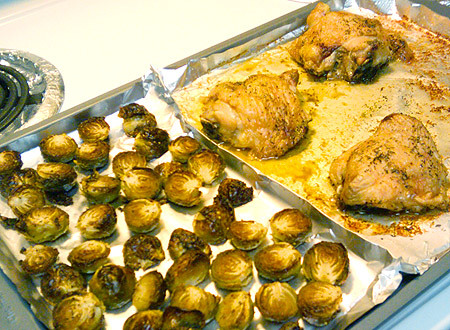 Scott prepped the sprouts (cut in half, ends trimmed, tossed with olive oil, pepper, salt, and some lemon-pepper seasoning) while I prepped the chicken (rinsed thoroughly, patted dry, removed that hard cartilidge nubbin next to the bone, sprinkled with salt, pepper and thyme). I have a big box of vinyl gloves that are handy for 1,001 household uses (hair coloring, food prep, and scrubbing while using chemicals are the biggies) and I usually clean the chicken with gloves on. As you can see, the chicken shrinks up somewhat when cooked. They totally covered their side of the pan when raw. I make a point of spreading the skin out as wide as possible, so it gets nice and crisp. Best part of the chicken, the skin. But Brussels sprouts are gross, you may say. I used to say the same, because I’d only ever had them steamed or boiled, which makes them taste and smell like tiny limp cabbages. Roasting in the oven makes them crispy on the outside, tender on the inside, and there’s no skunky taste at all. They’ve moved up into my top five cooked vegetables. They cook for the same time: 45-50 minutes at 375°. To finish up, I put a little lemon juice and some Parmesan cheese on my sprouts, and I usually dip the chicken in a bit of ranch dressing mixed with Frank’s Red Hot Sauce for a Buffalo chicken flavor.